I love potatoes, my family would agree that I grew up on stewed potatoes, baked potatoes, fried potatoes, mashed potatoes, potato soup, French fries... you name it! Oh, but I honestly had never tried begedil, a Malaysian delicacy before I came to West Malaysia. Anyway, Ralph just made begedil for the second time and it turned out great! First, he placed the potatoes in a saucepan of boiling water and cooked until potatoes were fork tender. 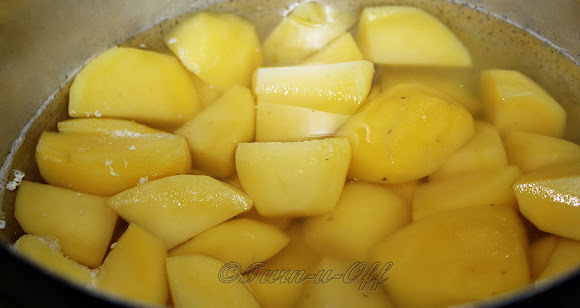 Once the potatoes softened, he removed them from the saucepan, strained them and started mashing them with salt. Then, he combined all the ingredients below including red bird's eye chilies together in a bowl and mixed well. Next, shaped the mixture into patties or balls and coated with beaten eggs. Deep fried the potato patties in a wok with hot oil until golden brown or cooked through. It was tasty, crispy and greasy, but really, when isn't deep fried food delicious? Yummmsss!!!! that looks delish dearie!!! pandailah R cook!